Copies of The Free Press normally ship within three business days. 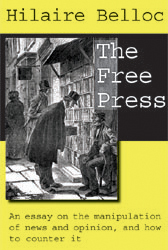 The Free Press is Belloc's unabashed look at the establishment which in his day was the Press and in ours is the Media. It is the only work of its kind, being a critique and analysis of the modern Media from the coherent perspective of a Catholic and a Distributist. In this remarkably subtle and thought-provoking essay, Belloc draws attention to the connection between Capitalism, Finance, and the Press, and from that premise explains the theoretical and practical evils which plague the modern Media, being as it is a creature of our modern economic and political system - not its critic and watchdog. The Free Press is not just a criticism of the horrendously evil influence of a Media which manipulates, controls, and suppresses news and opinion according to the dictates of the enforced liberal order of capitalism and so-called democracy. It is a surprisingly relevant and up-to-the-minute apology for a Free Press - a press which, despite economic and political disadvantages, is free to report accurate news and sponsor an intelligent and serious exchange of ideas. Of particular interest to the intelligent reader will be the Publisher's Preface, a thorough-going look at the modern Media Establishment and a discussion of what makes Belloc's writing from early in last century so important and so relevant today. Anyone who has ever suspected that the Media is more concerned with income than Truth will find Belloc's treatise of great value. It is an essential guide for forming a correct and intellectually sound opinion of the forces that control the Media and what can be done to liberate it. Don't delay! Get this stinging critique of the modern media establishment today!